Gypsy moth larvae are approx. 1 1/2-2 1/2 in. long with yellow markings on head their bodies are dusky, hairy, with 5 pairs of blue spots on dorsum and a double row of 6 pairs of red spots. The adult body is slender, dark brown with black bands across forewings; abdomen with yellow hairs. Flight zigzag. Wingspan 2 in. long; large, heavy abdomen prevents flying by females. The eggs numbers are over 400 in chamois-like masses of yellow hairs from female’s body deposited on the undersides of branches, tree trunks, loose bark, in cavities, on fences, stone walls, RV’s, lawn furniture, etc., wherever larvae may climb. The pupae are dark reddish-brown, with scattered red hairs, attached to some object by a few silken threads. 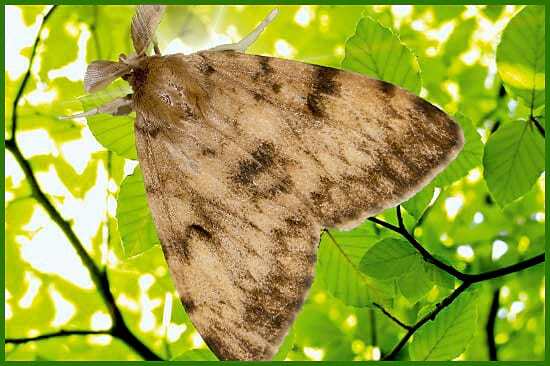 Gypsy moth Preferre Apple, basswood, birch, hawthorn, oak, poplar, speckled alder, and willow. These trees can be infested but are not preferred hosts; Ash, balsam, butternut, catalpa, cedar dogwood, holly, locust, sycamore, walnut, yellow poplar, fir and many other species. 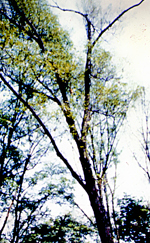 Defoliation, larvae on silk threads, chamois-like egg masses on undersides of objects and at bases of tree trunks are some of the symptoms observed. Moths emerge and mate; eggs deposited in July-August. Egg stage overwinters will hatch in early May. First instars spin down tree through 5-6 instars; fully-grown in June-July. Pupal stage lasts 10-14 days.